Spring has finally sprung on the banks of magical Lake Como. Life is returning to the parks and gardens and the first guests are ordering their drinks on the terrace after the winter interlude. This is also the time of year when entrants to the Concorso d’Eleganza from all over the world start making final preparations in relation their classic vehicles ready for the big performance in a few weeks’ time. Let’s use this moment of anticipation to take time out. We would like to invite you to cast your mind back to perhaps the most grandiose period of the automobile. Precisely 90 years ago, in 1929, two events wrote history at virtually the same time. Yet, they took place 1000 kilometres apart from each other – and their consequences remain a source of great joy to this day. 90 years ago, automobile elegance was celebrated for the first time at one of the most exclusive venues on the shoreline of Lake Como, with the aim of holding a beauty contest. The precise date was 1 September 1929 when 80 vehicles competed for the “Coppa d’Oro di Villa d’Este” under the strict eyes of the Jurors. This was a trophy that was transformed into a instant legend. 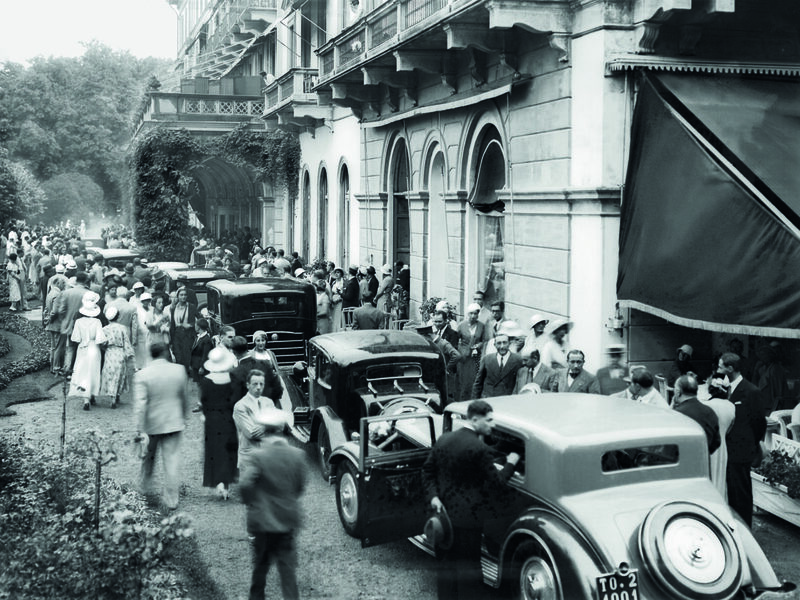 During the 1920s, the Grand Hotel Villa d’Este had already been famous for many years as an idyllic paradise. The unsurpassed combination of style and luxury had established it as one of the preferred sanctuaries for the upper echelons of society from nearby towns and cities. The Grand Hotel was particularly popular with guests from Milan who travelled for just under an hour to relax here. The journey was by no means too arduous even from Turin. This venue provided perfect surroundings for the most beautiful and impressive automobiles. Most of the exhibits were created in the surrounding region. The automobile industry had become established in Northern Italy, primarily located between Milan and Turin, and innumerable coachbuilders also set up business here. The one designed and built exquisite technology, the other penned and bodied breathtaking design. This congenial cooperation between two industries defined the benchmark for the entire world at the end of the 1920s. A further logical step was the desire to award the most elegant design from among the exclusive breadth of automobiles available. 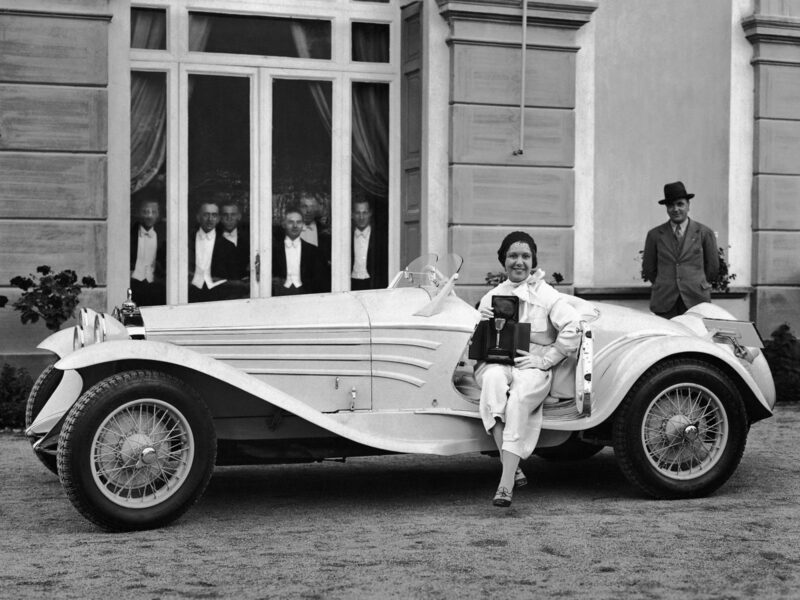 In 1929, the first Concorso d’Eleganza already developed into an inspiring mix of genuine competition and a social and business come-together. Our function as chronicler means we are not going to miss the opportunity to name the imposing Isotta Fraschini Tipo 8A Faux Cabriolet, clothed by Italiana & Cesare Sala, as the first of a long series of winners of the “Coppa d’Oro di Villa d’Este”. This car wrote history with its achievement and in the years that followed, the Concorso d’Eleganza developed into an incomparable event that nobody of note wanted to miss – the big marques, the coachbuilders, the automobile owners – they all wanted to be there. Designers were motivated by this excellent reputation to new, at times eccentric achievements, and sometimes also lines balanced in perfect equilibrium. Since 1949, the Alfa Romeo 6C 2500 SS styled in its coupé body from the famous Carrozzeria Touring in Milan is regarded as one of the most outstanding vehicles ever to take the podium as the winner of this competition. Its calm, subtly elegant lines combined with the most sophisticated technical details to lend it the status of an icon even today. It is an extraordinary honour for the car, like the event, to bear the soubriquet “Villa d’Este” in its name ever since. In the same year, albeit 1000 kilometres further north, another important chapter was being opened in automobile history. This performance unfolded at a production building in Berlin-Johannisthal in March 1929. This was the place where the first BMW automobile was created. Or to be precise: The BMW 3/15 PS was the first BMW on four wheels. The Munich-based company continued to write a success story that had already begun. BMW had already started building aero-engines in 1917 and six years later the first BMW motorcycle rolled out of the factory into the street. When the automobile market was booming, BMW decided in the late 1920s to produce the successful Austin Seven. This small car from England was initially produced under licence in Eisenach, Thuringia. BMW developed this into the 3/15 PS, which immediately launched its career in 1929. In the year of its premiere, the little car won the demanding International Alpine Rally. It battled over all the big passes for five long days – a truly impressive achievement. Such a sensational success provided motivation for BMW. The sporty BMW 328 followed on with its famous six-cylinder engine, and BMW continued its success story after the Second World War. The masterful V8 models and the glamorous 507 roadster appealed to the luxury segment, and world stars like Elvis fell for their allure. At the same time, BMW drew on its great experience with motorcycles in order to develop new solutions for those road-goers who wanted to move from two-wheelers to four wheels. BMW gave impetus to the economic miracle with the unique Isetta and later the 600 and 700 models. 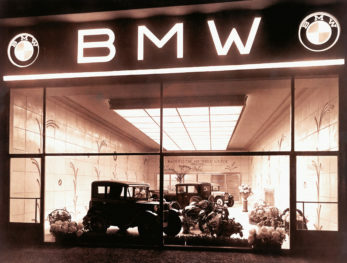 Over the course of the 1960s, BMW heralded a new era in automobile production with the “New Class”. The agile, streamlined and sporty models defined new benchmarks which are still valid today. The launch of the 5 Series and a little later the 3 Series and the 7 Series in the 1970s created a new model perspective. The comprehensive range of vehicles from compact cars to the premium luxury class are all derived from this perspective. A 3/15 PS from the year 1929 seems a long way removed from all this. Yet a second glance at the phenomenon quickly reveals a clear thread running through the different eras. 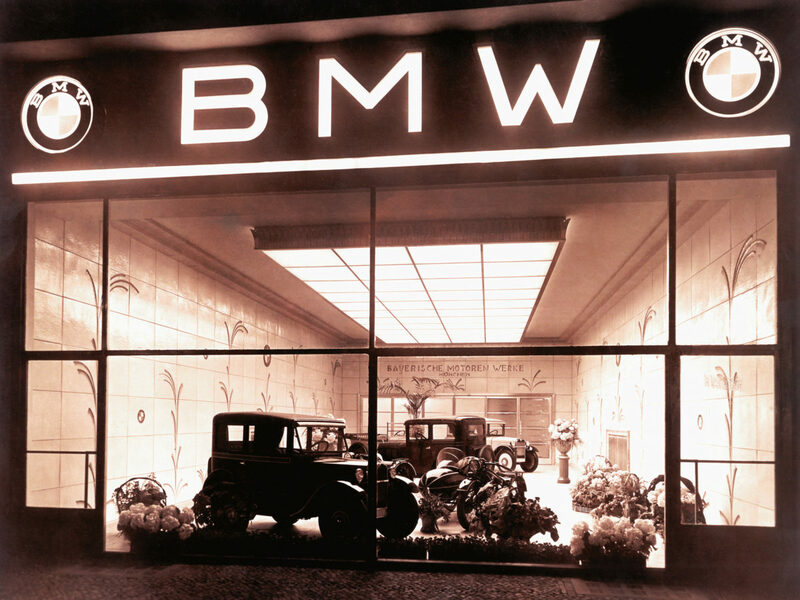 BMW has been building automobiles for 90 years and driving has always been the central focus. A small group of private enthusiasts, came along in the mid-1990s with the aim of scrupulously restoring the old glamour to the Concorso d’Eleganza. BMW was captivated by this vision. When the opportunity arose in 1999 to become the patron of the event, BMW accepted the challenge. This was the start of an impressive development that has now been continuing for the past 20 years. When BMW was first officially associated with the Concorso d’Eleganza in 1999, the public saw this as a new departure. The event held on the shores of Lake Como built on its outstanding reputation and great tradition. In contrast to the early days, automobiles that were now historic competed against each other – and the illustrious contest that had more of a national profile in 1929, quickly became established in the calendar of major collectors around the world. The demand from potential entrants increases every year. BMW decided to intensify its engagement and in 2002 joined forces with the Grand Hotel Villa d’Este as co-organiser with overall responsibility for the orientation of the Concorso d’Eleganza. This laid the foundation stone for the continuous development over the coming years in which enthusiasm for classic cars quickly burgeoned. BMW also initiated a new class in 2002 that combined the past with the future. Current contemporary prototypes formed their own class for the first time and this provided a perfect reflection of the contest’s original idea. The elite from automobile design competed directly against each other. Throughout the world, there is no other opportunity to experience a wide range of different prototypes side by side. What’s more, the contest takes place in the open with natural daylight and – this makes it even more unique – in motion. This is because only vehicles able to move under their own power are permitted to take part as entrants. Another minor revolution followed in 2011. BMW reformulated the idea of the Concorso d’Eleganza from a new perspective and established a second contest for motorcycles. As in the case of the automobiles, curators have nominated new classes every year and apply their great expertise to select the participants from the applications. The reputation of the event on the shores of Lake Como has attracted a fascinating new group of collectors and fans through the new approach. Since then, they and their classic two-wheelers have brought their own dedicated dimension of glamour to the spectacle of the Concorso d’Eleganza with its long heritage.